RI Saltwater fishing comes naturally to Captain Charlie Donilon owner of the charter boat Snappa. He has been in the Rhode Island charter fishing and diving business for over 25 years. His apprenticeship was served as a mate working three years on Pt. Judith, RI party boats and another three years on charter fishing boats in Rhode Island and Florida. He received his first 6 passenger charter license in 1974. The license was eventually upgraded to 100 tons, 100 miles, Master license in 1979. Captain Donilon holds an Associate Degree in Commercial Fisheries and Marine Technology from the University of RI and a Bachelor Degree in Industrial Arts Education from RI College. 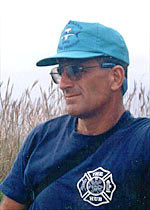 In 2008, he retired from the Warwick, RI Fire Department after twenty years of service. Six years were spent as an Emergency Medical Technician on rescue and 14 years were served on engine companies. Captain Donilon now charters his boat seven days a week piloting exciting Rhode Island fishing adventures. Whether running the boat from the bridge or providing side-by-side coaching lessons to customers in the cockpit as they fight “The Big One”, Captain Donilon is engaging and enthusiastic. He will entertain you with stories from over 25 years of experience in Rhode Island fishing charters. The Captain is a people person who loves his work, and clearly committed to providing the best customer experience. Before you book a Rhode Island charter boat, please call the Captain to get an impression of his character and personality. You will be aboard the boat for quite some time. It is important that you choose a Captain that is compatible with you and your group. Fishing knowledge and years of experience are equally important in providing a safe, comfortable, and memorable day, in a relaxed but professional atmosphere. We look forward to your call. Captain Donilon is also available as a Rhode Island saltwater fishing guide for one-on-one boat handling and fishing lessons on your own boat. Topics include bait rigging, fishing techniques, filleting, knot tying, navigation, deck layout design, and fiber glassing. He also offers saltwater fishing seminars to fishing clubs during the winter months. A 3 or 4 hour session could expose you to years of experience that would normally take you countless hours to learn on your own, the hard way!